If i understand this correctly, then the location information is sent from the device itself (fields DevLat and DevLon) via the API message. Do you know if geolocation by triangulation via the gateways on the roadmap? This would free up space on the payload and still deliver functional, correctly timed geolocation of the device. No you do not understand this correctly . I see there is some confusion about this so I added a new paragraph "Geolocation by triangulation" to the TS. What I mean to say is that this is triangulation. The API message are added by the core server, not by the device. No extra effort on the device side is needed. Yes, it makes total sense. The IOT device can remain simple and the servers do the number crunching..
Would the system also be able to calculate height coordinates? The system isn't capable to calculate height coordinates yet. But it's a feature on the roadmap with no estimated time of arrival! - How can I be provisioned with geolocation tests? - What is the latest planning on the geolocation availability in the production environment? Is my interpretation correct that I see contradiction statements in the opening post regarding ADR? 1) This connectivity plan uses forced ADR and the antenna diversity setting is 3. In addition, we recommend to switch-on ADR for the devices that are used for Geolocation. 2) Please use SF12 with ADR off for these test. Note that in the final solution, ADR has to be switched on! Is statement 1) about the default setting for the device once geolocalisation is fully available and statement 2) for the testing phase you're currently in? So, for testing geolocalisation now, should ADR be switched off? Through trial&error I've found out that the network must control the data rate when testing geolocalisation. Thanks for sharing your findings Bert! How can I test geo location fro the dev portal? Do you have a contact at KPN for LoRa? Geolocation is as far as I know not yet accessible. If you're interested I can get you in touch to get access. Tests are only available in a limited number of locations and only valid for stationary cases. Hi Tim. 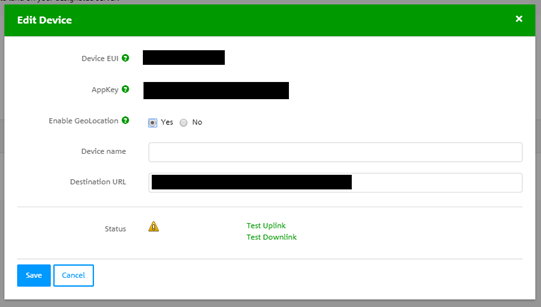 Please connect me with someone from KPN to test. Cheers! While looking through my LoRa Data I noticed the "LrnDevEui" of an uplink messages is in capital letters and the "LrnDevEui" of a location message is not. This caused some unexpected problems while sorting my data by "LrnDevEui". Are you aware of this difference and is there any reason for it? Thanks in advance, I hope this will be changed in the near future. Hello @jankappe, we are currently looking into this problem. I'll post an update if we make any progress. Hi @jankappe, can you share a JSON message with us? If possible, one normal, and one location type. Thanks for sharing! I've forwarded your message to my colleagues. Hope we'll find the cause soon, I'll let you know. We cannot reproduce this! I have fetched the JSON message trough the developer portal, but if I send the message in uppercase letters, it will look like this again. The message is not changed on the way. Therefore we think the problem should be found within your application server. Strange! I will look into it. Thanks for your time. Could you help me get in touch with a KPN contact to get access and test Geolocation? Sure! Can you sent me a PM with your DevEUI? "Tests are only available in a limited number of locations and only valid for stationary cases. Moving objects are not supported yet." Can someone explain if this is still the case ? Why are moving objects not supported ? Any details ? Why are moving objects not supported ? Accuracy of the fine timestamps which are used for LoRa TDoA positioning is disappointing, and multipath propagation brings even more troubles. So you need a (huge) number of messages to feed the filter/solver with their ts and other metadata to get not-too-disasterous positioning accuracy. Actually, that's why Actility had gave up and bought Abeeway which provides assisted GPS solutions. -Is this filter already implemented ? -Is each calculated loacation indpendendly calculated from the timestamps? Or does it take into account previous locations? -Are there algorithms implemented which assume the node is non moving ? -What would be the best way to have location updates for moving objects ? Send 'frequently' on SF11 ?